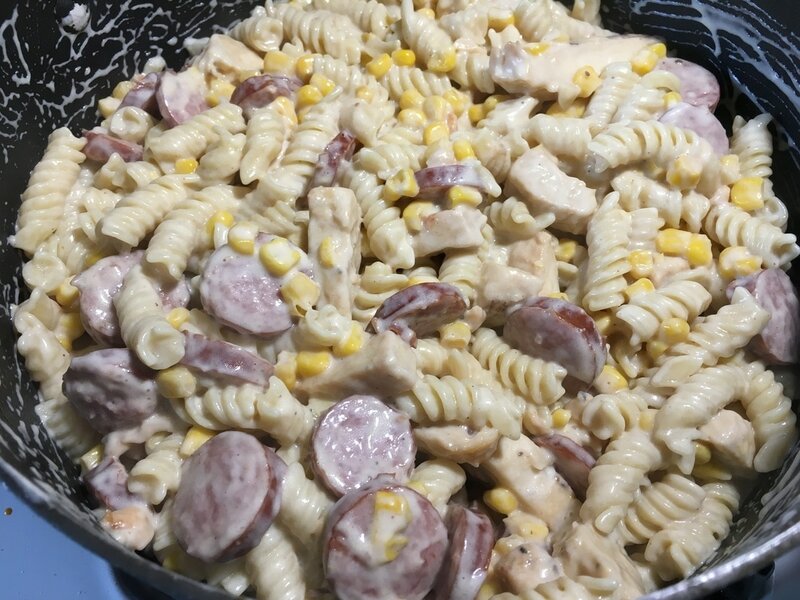 One of my brothers picked up this recipe from a friend and basically made it his own specialty at home which became a huge hit with my siblings. 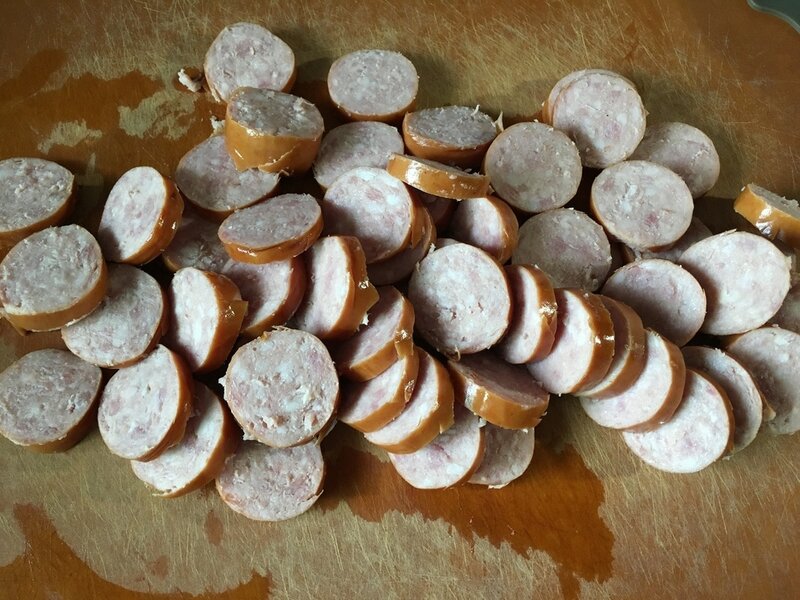 This recipe has nothing to do with the original Hungarian dish. I'm assuming he named it this because it sounded cool, I really don't know. 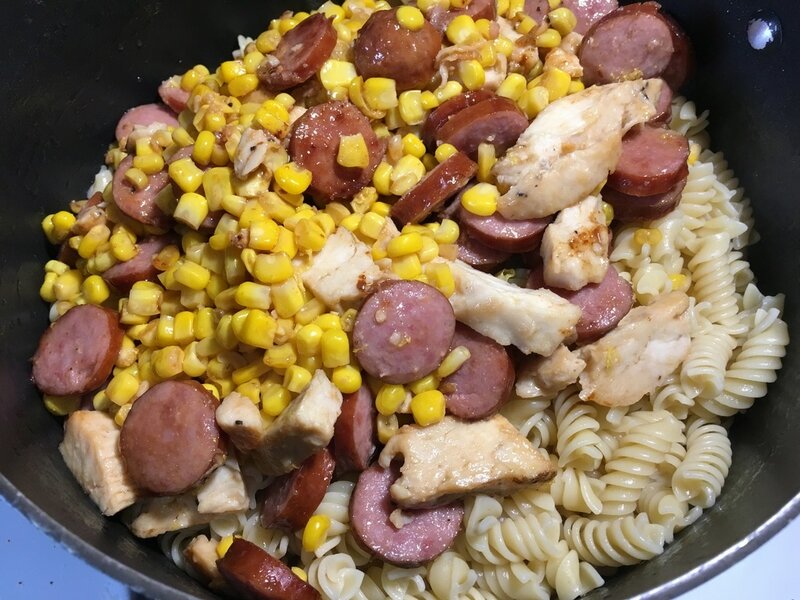 But the combination of sausages, chicken and corn with pasta is a family favorite and the kids love it. So the next time you think of Goulash, think of this instead of Hungarian food. Your kids will love saying the word as much as the recipe itself. There are a few substitutions compared to my brother's version. 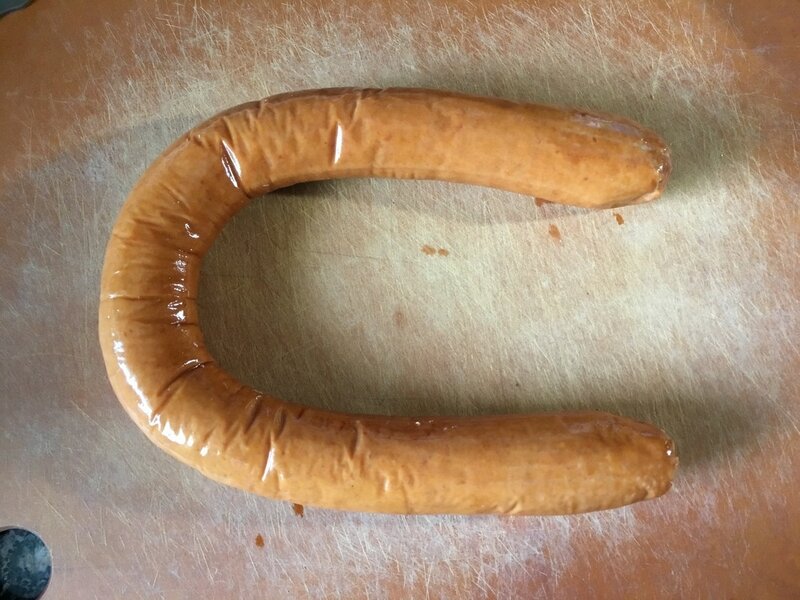 The main one is the type of sausage. 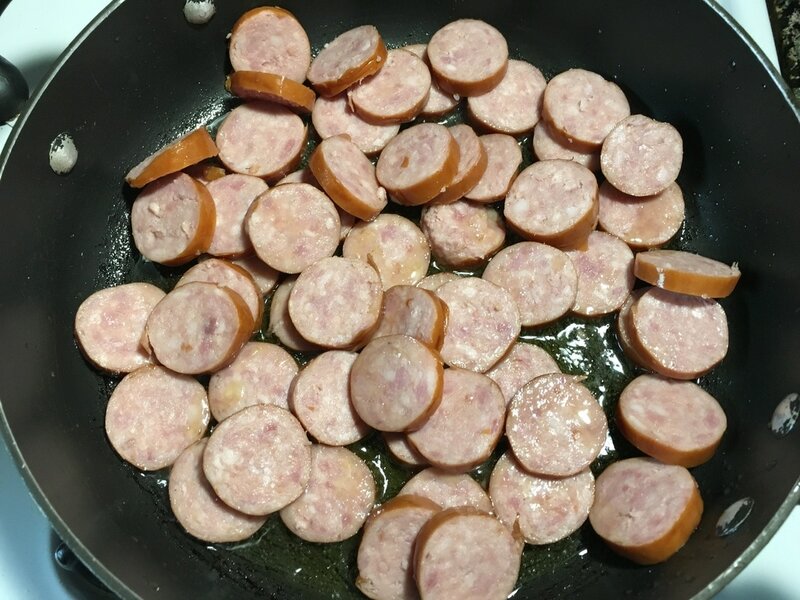 He uses Roger Wood brand sausages. If using this sausage, you can omit the olive oil because this brand renders a lot of oil. I use Hillshire Farms because Roger Wood is not available in my area. The second thing is the chicken fajitas brand. 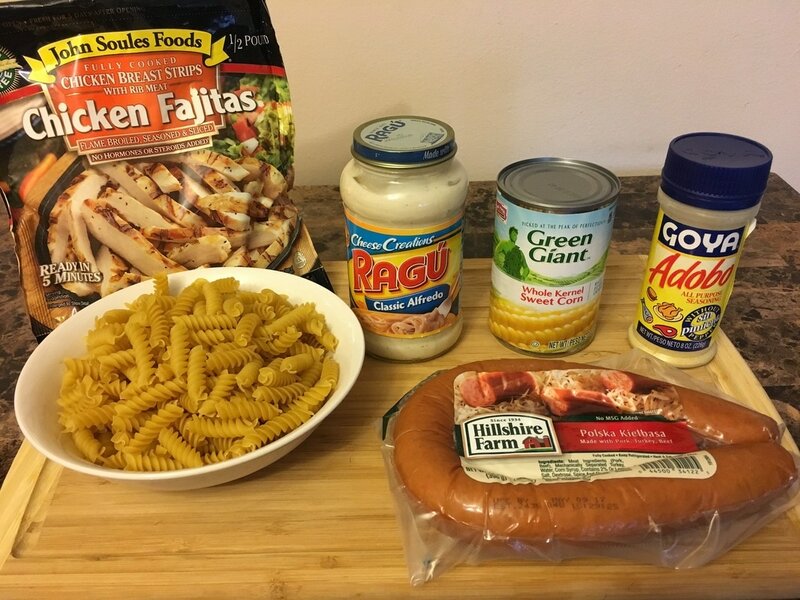 He originally uses the Tyson's Chicken Fajitas but either brand works just as well. One last option is to use Ragu Double Cheddar sauce instead of Classic Alfredo. I once made it for a friend with the double cheddar sauce. She and her children loved it. 1. Cook rigatoni pasta according to package directions until it reaches your desired tenderness. Be sure to lightly salt the water and add about 1 tbsp. 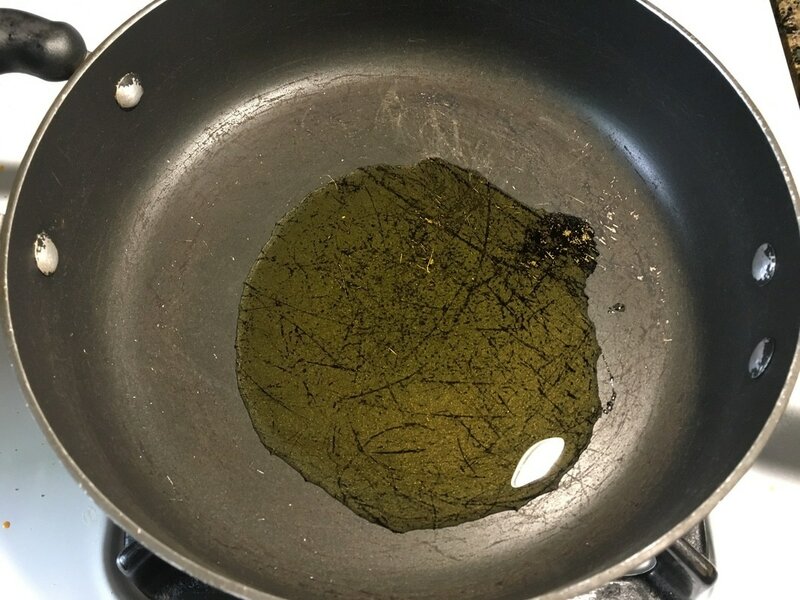 of oil before adding in the pasta. 2. 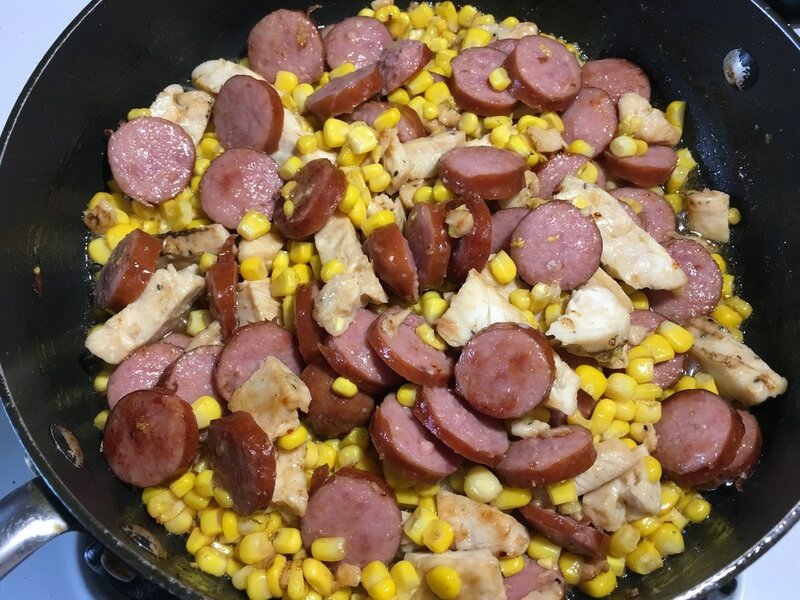 Meanwhile, slice the sausage into bite-sized pieces, drain the canned corn, and set both aside. 3. In a pan on medium high heat, add 2 – 3 tbsps. 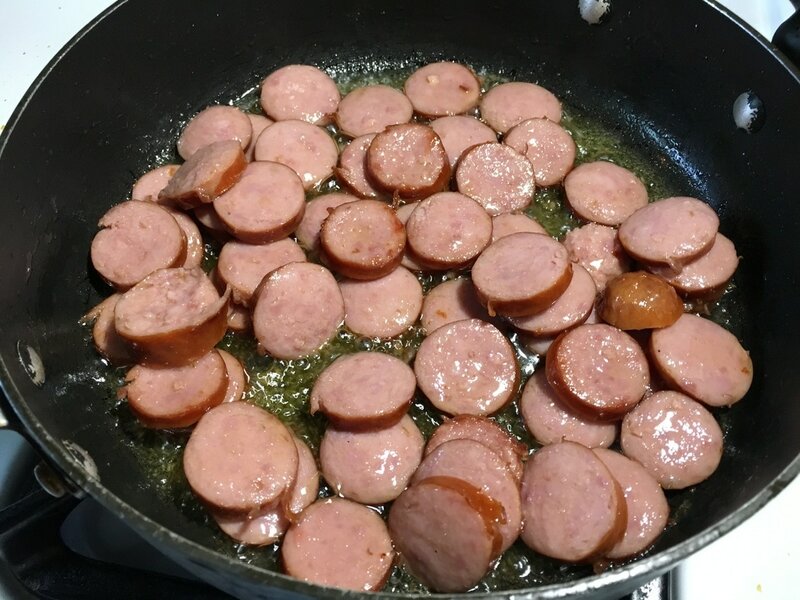 of olive oil and the sliced sausages. 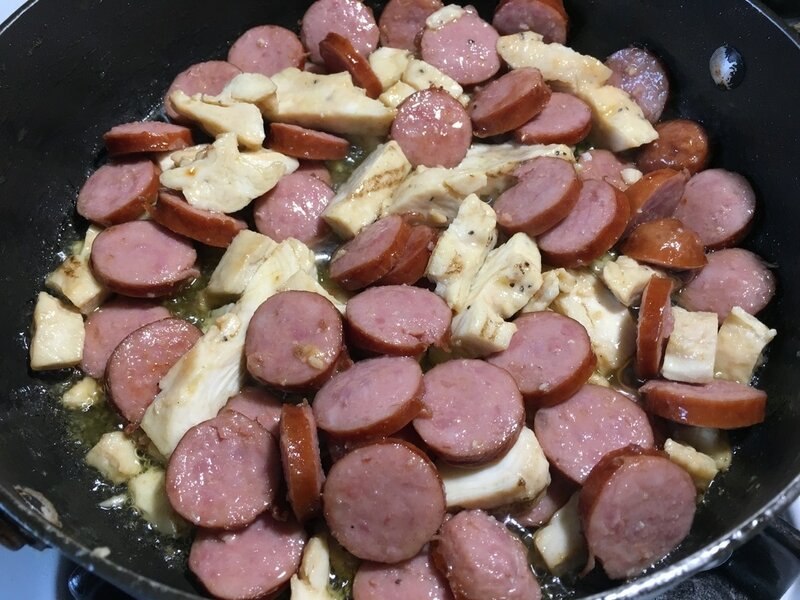 Sauté for about 2 – 3 minutes, stirring occasionally. ​4. 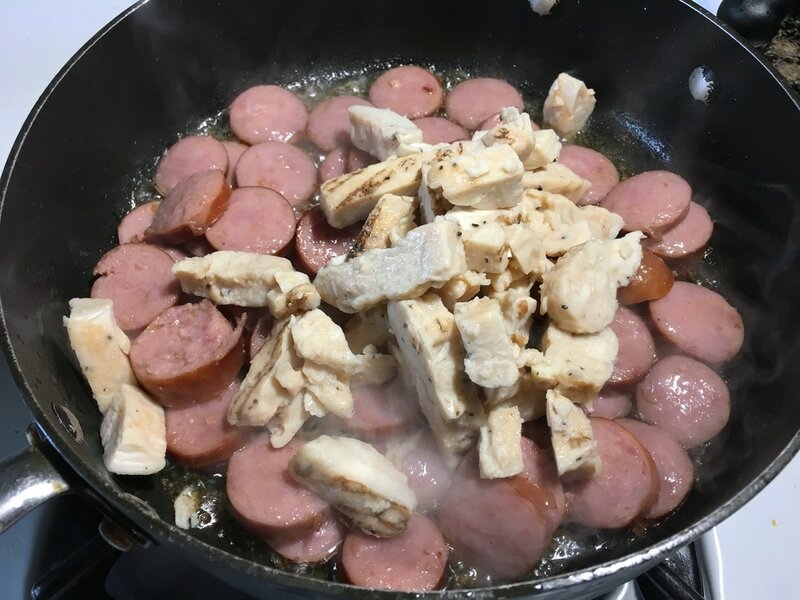 Add the chicken fajita strips to the sausage and continue to sauté for an additional 4 – 6 minutes, stirring occasionally. If desired, add in a few splashes of tabasco sauce to taste. I usually omit the hot sauce so that my toddler son can enjoy it so it isn’t seen here. I also prefer it without hot sauce anyway. 5. 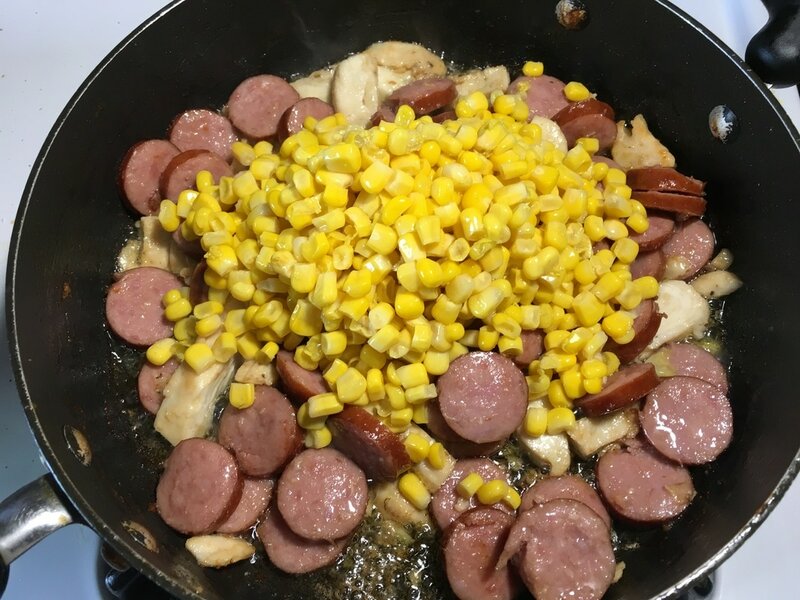 Add in the drained corn to the sausage and chicken, mix contents thoroughly, sauté for about another minute, and turn off the heat. 6. By this time, the pasta should be cooked through. 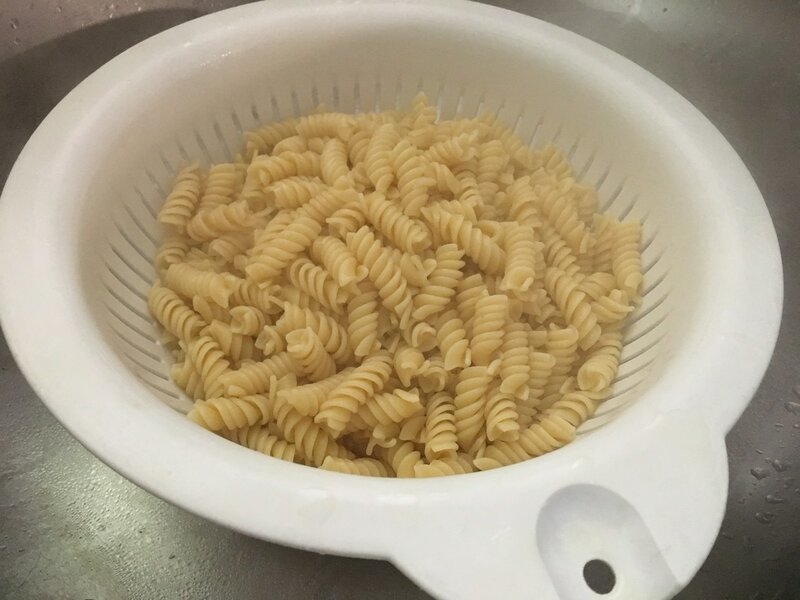 Turn off the heat, drain (do not rinse with water) and return pasta to the pot immediately while it is still hot. 7. 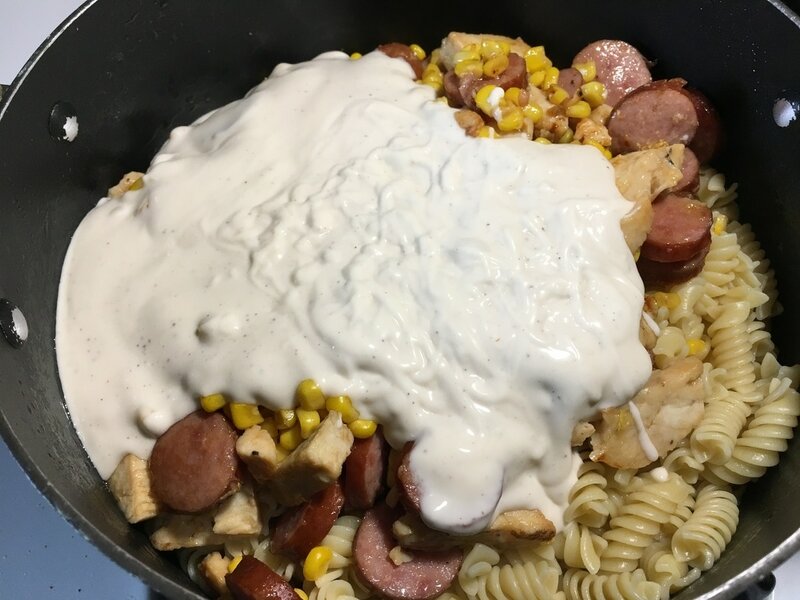 Add in the sautéed sausage, chicken, and corn mixture to the pasta. Pour in 1 jar of Alfredo sauce. 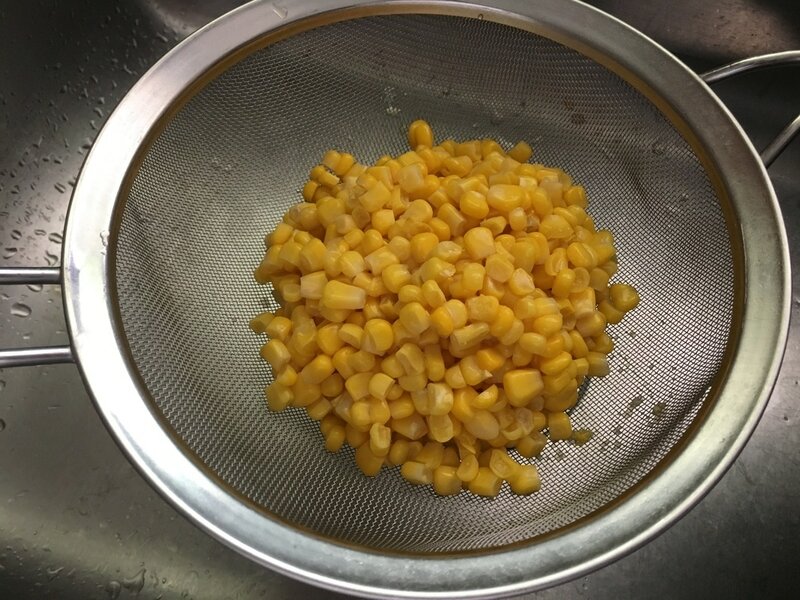 Mix contents thoroughly. 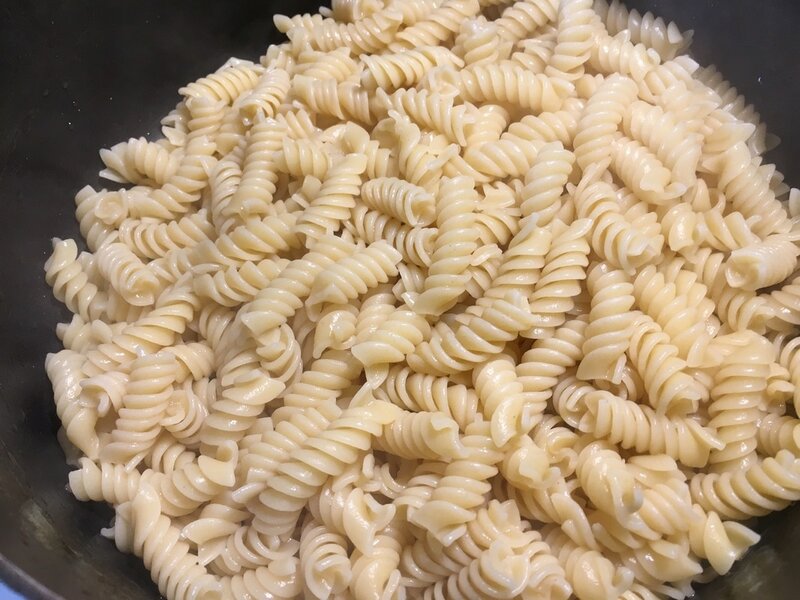 Sample the pasta and if desired, add about ½ tsp. or to taste of Goya Adobo. Mix to combine well. Serve immediately. What do you think of this recipe? Do you prefer with or without hot sauce?